1. Main Structure of the CNC cylindrical grinder, when in combination angle control of spindle by C axis, is capable of grinding various special shaped workpiece. 2. Working spindle carried with precision angle decoder, high resolution of angle control reaching up to 0.1 μm. 4. 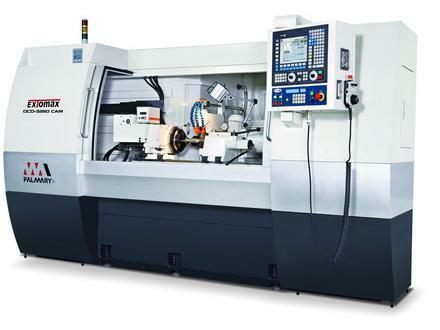 Retaining various functions of CNC cylindrical grinder, and applicable to angle and speed control. 5. Fast and easy transferring custom-made grinding porgram, when operated with PALMARY-developed CAD/CAM software. 6. A high-speed algorithm controller executed under PC Based + Windows XP, allowing input of 3rd-party software. 7. An optional sound frequency anti-crushproof system,consistent grinding operations are ensured. Another benefit is toprevent parts colliding caused by erroneous motion when executing program. 8. Un-point dressing device or roller type dressing device is equipped according to functional requirement. 9. USB access, combined with the market available USB high-speed transmission interface, providing excellent data portability. 10. With 1ms single session processing time. Speed 10-500 R.P.M. 10-500 R.P.M. 10-500 R.P.M. Cam Grinding Speed 0-30 R.P.M. 0-30 R.P.M. 0-30 R.P.M.